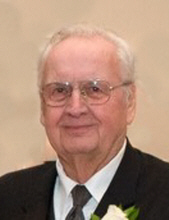 Raymond N. Lavanway, 88, of Ludlow, VT passed away in Lebanon, New Hampshire on November 28, 2018. Husband of the late Lillian Kautz Lavanway, father of Melissa (Carmen) DeLuca and Michele (Richard) Lynch, both of North Haven, and grandfather of Richard and Kristin Lynch and Kayla and Shayna DeLuca. He was born in Winchester, CT on June 28, 1930, son of the late Harold Lavanway and Arline Rausch, stepson of Martha Lavanway, and resided in North Haven before moving to Ludlow in 1999. Raymond received a B.S. degree in Engineering from the University of New Haven and proudly served in Korea with the U.S. Army 79th Engineer Construction Battalion and the 24th Engineer Construction Group from 1948-1952. He was employed at Mark IV Enterprises of Hamden for 41 years prior to his retirement. While residing in CT Raymond was a member and Treasurer of Trinity Lutheran Church in New Haven, and served on the Friends of Lighthouse Park Restoration Committee. Raymond was also a member of the United Church of Ludlow, VT and a volunteer with the Black River Good Neighbor Services of Ludlow. He always enjoyed reading, playing bridge, and snowmobiling. Relatives and friends are invited to visit with Raymond's family at BEECHER & BENNETT, 2300 Whitney Avenue, Hamden, on Thursday, December 6th from 5:00-7:00 p.m., followed by a prayer service at 7:00 p.m. Interment in Beaverdale Memorial Park will be private. In lieu of flowers, memorial contributions may be sent to the Black River Good Neighbor Services of Ludlow, 37B Main St., Ludlow, VT 05149, www.BRGN.org. To send flowers or a remembrance gift to the family of Raymond N. Lavanway, please visit our Tribute Store. "Email Address" would like to share the life celebration of Raymond N. Lavanway. Click on the "link" to go to share a favorite memory or leave a condolence message for the family.